28 Northcliffe Terrace, Surfers Paradise, Queensland, 4217 Australia. Longbeach offers the ultimate holiday lifestyle. Located in the heart of Surfers Paradise, Longbeach offers the perfect accommodation solution for an affordable Gold Coast getaway. 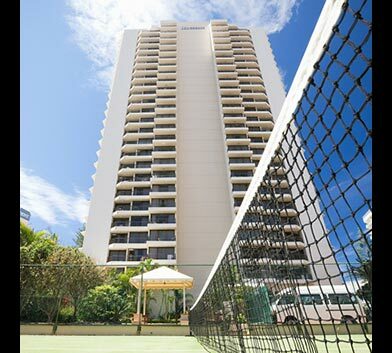 Just 50 metres from Surfers Paradise Beach and a hop-skip-and-jump away from the bustling hub of Cavill Avenue, the resort offers convenience and comfort in a great location. 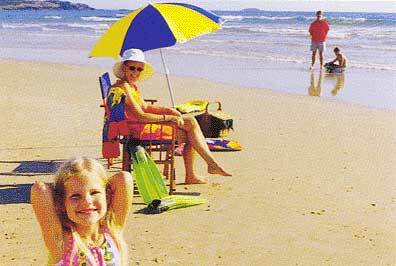 Ideal for a fun family holiday, Longbeach offers spacious one, two and three bedroom apartments all with ocean views. The fully self-contained apartments include kitchen and laundry facilities, cable TV and large balconies to make the most of the stunning views over the Pacific Ocean. Recreation facilities at Longbeach include an indoor and outdoor swimming pool, children’s wading pool, spa, sauna, tennis court and BBQ facilities. There’s also an indoor games room to keep the kids entertained. 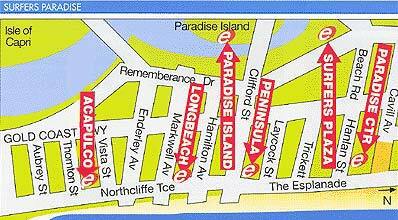 Longbeach is all about location, just 50 metres from Surfers Paradise beach and 300 metres to the main Cavill Ave shopping and dining precinct. Longbeach features fully self contained one, two and three bedroom apartments all with stunning ocean views of the Pacific Ocean. Apartments feature air conditioning (on request) and provide pleasant décor, perfectly matched to the holiday atmosphere of Surfers Paradise. Available in one king or two single beds. Available with one queen + four single beds.